Golf chief Peter Dawson has shrugged off doubts that poor attendances could threaten Carnoustie's hopes of hosting the Open in the future. 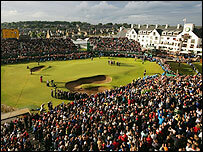 "We'll be coming back to Carnoustie if they will accept us," the Royal & Ancient Club chief executive told Five Live. "There is no doubt about that. "Carnoustie is firmly on the Open rota and it is one of our strongest venues. "Everything has worked very well here this week. We are pretty pleased with the crowds, given the weather." Is Carnoustie one of the Open's best venues? He added: "The weather was horrid on a couple of the days and a number of the practice days. "My fears when I saw the rain falling was that the crowd figures would be smaller than they have been so we are very happy." Dawson also reiterated his belief that there was not a drug issue in the sport after recent allegations that it was a problem in golf. "Let me say first of all that it is very easy to say that people may be taking drugs and that no-one can refute a statement like that," said Dawson. "But there is absolutely no evidence or anything for these remarks in the game and I think most of the top players in the game today have backed that view."